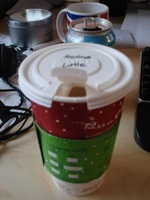 A New Starbucks Lid At Last? I received this lid from a Starbucks last week. My first thought was that Starbucks had finally listened to my demands and had discontinued the permanently-open “sippy cup” lid in favor of this lid. I soon came to the realization, however, that this was simply a backup lid, probably purchased from a local drug store when supplies ran low.